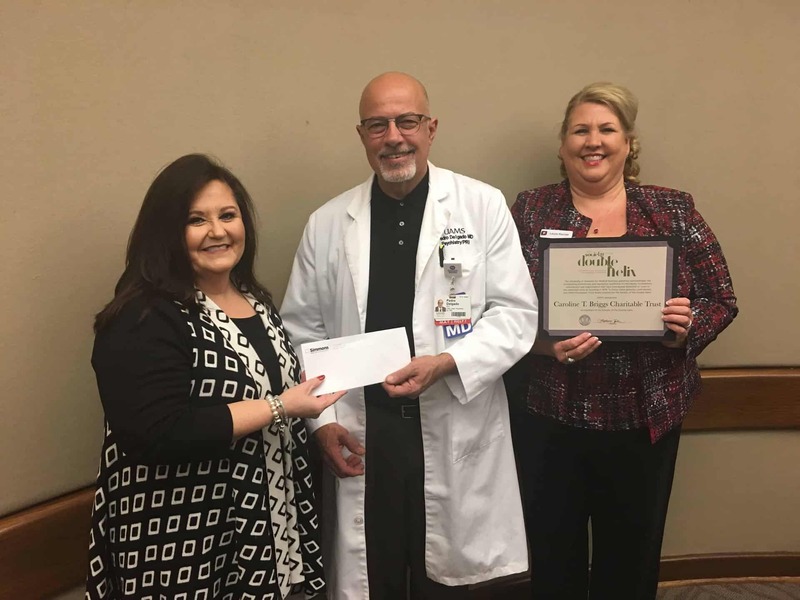 Simmons Bank’s Cathy Brazeale (left) and Laura Parrish (right) present a $436,000 check to Pedro Delgado, M.D., director of the UAMS Psychiatric Research Institute, on behalf of the Caroline T. Briggs Charitable Trust. Jan. 3, 2018 | Jan. 3, 2018 | A gift of $436,000 will allow the Psychiatric Research Institute at the University of Arkansas for Medical Sciences (UAMS) to fund additional research into schizophrenia, a serious mental disorder that can cause hallucinations, delusions and a loss of touch with reality. The donation from the Caroline T. Briggs Charitable Trust was delivered Dec. 19 by representatives of the trust and Simmons Bank to Pedro Delgado, M.D., director of the institute and chairman of the Department of Psychiatry in the UAMS College of Medicine. Briggs, a native of Pine Bluff, passed away in 2016 at the age of 92. The trust is overseen by Simmons Bank. The bank’s Cathy Brazeale, a vice president and trust officer, and Laura Parrish, a trust officer, represented the Briggs trust during the presentation. Brazeale and Parrish later toured the institute to learn more about its research efforts. Among the sites they visited were the transcranial magnetic stimulation suite, the Walker Family Clinic and the Brain Imaging Research Center. According to the National Institutes of Health, about 1 in 100 people in the United States have schizophrenia, which affects how a person thinks, feels and behaves.